Water availability is often a factor in how variants of plant species evolve. Researchers statistically mapped regions of the panic grass genome linked to morphological traits such as thriving under scarce (xeric) or moderate (mesic) water availability. The information lends insights into how ecotypes are formed as evolving populations of a species adapt to a particular environment. Identifying the genomic regions involved in how panic grass responds to water availability is of interest for studying its close relative switchgrass, a candidate bioenergy feedstock. For the U.S. Department of Energy, switchgrass (Panicum virgatum) holds promise as a potential bioenergy feedstock because it is a perennial grass that is also salt-tolerant, drought-tolerant, and thrives on marginal land. However, the plant is also polyploid, containing multiple copies of its genome, and this makes it difficult for researchers to map its genetic code. Hall’s panic grass (P. hallii) is a smaller, close relative of switchgrass with a shorter life cycle. The DOE Joint Genome Institute, a DOE Office of Science user facility, is sequencing this plant to develop it as a model system for genetic and genomic work. 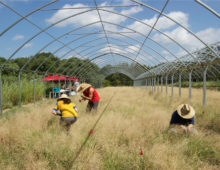 In a New Phytologist paper published September 23, 2014, a team from the University of Texas-Austin and including DOE JGI researchers utilized the genetic similarities between switchgrass and panic grass to identify traits related to the grasses’ ability to thrive under various water availability conditions. Using two varieties of P. hallii — var. hallii that thrives in very dry habitats and var. filipes that thrives in habitats with moderate water levels – the team statistically mapped (through quantitative trait locus or QTL mapping) traits involved in the divergence of this species. The team mapped QTLs for 9 morphological traits and, in one instance, found that 5 traits including tiller and leaf size and shape as well as flowering time map to the same region. The team noted in their study that their findings suggest some traits involved in the formation of variants may evolve in tandem, while other traits evolve independently. This work will allow the association of genomic features in panic grass’s with its responses to water availability; given the similarity of panic grass to switchgrass, this will point researchers to those genomic regions in switchgrass that could serve as targets for further studies to learn how to exploit these regions for the improvement of switchgrass for bioenergy.